The ArtCAM Newsletter contains all the latest news, case studies and industry information and special ArtCAM offers that you won't find anywhere else! 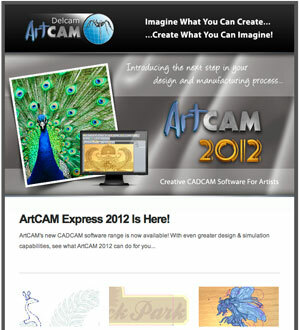 If you would like to sign up to the ArtCAM Newsletter, please enter your email address into the box below. To unsubscribe from the ArtCAM Newsletter please send an empty email to artcam-quarterly-request@delcamezine.co.uk with the subject line as unsubscribe. Please ensure that the unsubscribe email is sent from the address you wish to unsubscribe. If you're having problems unsubscribing from the newsletter list, please email info@artcam.com for help.